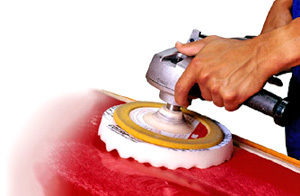 The 3M Perfect-It Foam 8" Compounding Pads (2 Pack) are used to apply compound to remove sand scratches and swirls. Patented convoluted-foam face design. When used with 3M Perfect-It II Rubbing Compound (Part# 05973 or 05974), microfine grade 2000 scratches are effectively removed from any automotive paint finish, leaving an extremely fine finish. Convoluted foam face design holds compounds better and reduces slinging of compound. Attaches to either 3M Compounding and Polishing Backup Pads (Part# 05717 or 05718). Contains 2 foam pads per bag. When used with 3M Perfect-It II Rubbing Compound (Part# 05973 or 05974), Microfine Grade 2000 Scratches Are Effectively Removed From Any Automotive Paint Finish, Leaving an Extremely Fine Finish. 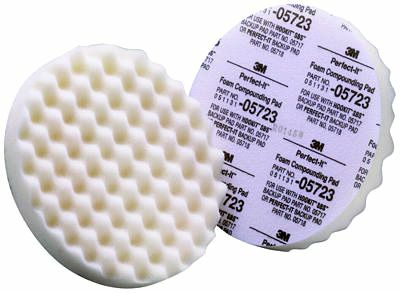 Attaches To Either 3M Compounding and Polishing Backup Pads (Part# 05717 or 05718).